Mount Pleasant Granary - Comments - Monday 6th. April, 2015 – Holiday Monday. Sunday 5th. April, 2015 – Easter Day. This is Rachel's Easter tree -- we always have little eggs hanging from a tree made out of branches. 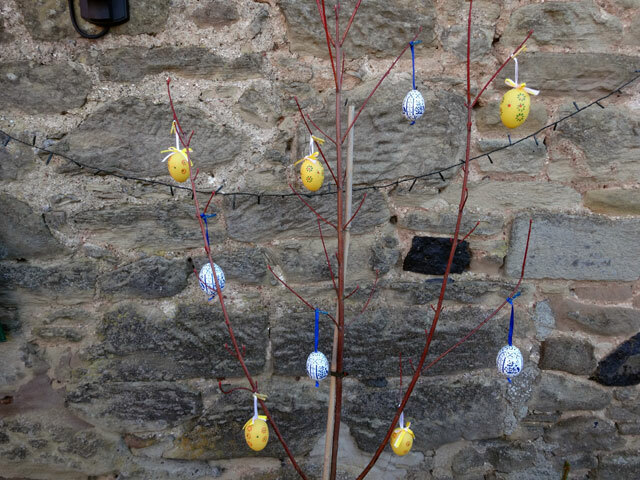 Some have come from holidays at places like Prague with its wonderful Easter market), others Rachel has made herself: but Easter wouldn't be Easter without our Easter tree! Well today is a holiday but I had to work. The day was spent getting everything in order for the Presbytery meeting tomorrow evening. Presbytery is definitely taking up much more of my time than I had anticipated, still it is only for this one year but my other projects are certainly being neglected. I tried to catch up on emails and did manage to sort out my finances and, of course, Mix and I went for a walk: the weather continues to be wonderful! After eating together with the family in the farmhouse we settled down in front of the television. I watched the semi-final of University Challenge and then, because there was little else worth watching I came back out to the Bothy to do a bit more work until it was time for the news, after which we walked the dogs and went to bed.